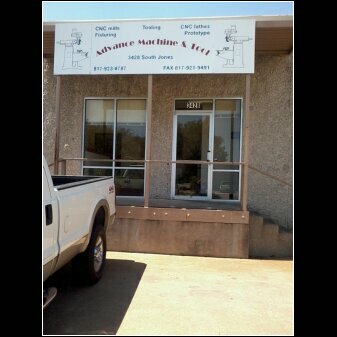 Advance Machine & Tool has provided the highest quality machining service since 1990. We continue to grow thanks to our customers support and new demands of and ever changing manufacturing world. Take a minute to browse our website. Our company partners, Joe Jarrett & William (Willy) Schmidt had a vision of becoming the "Go To Machine Shop" in Fort Worth, TX and surrounding communities. That vision has become a reality not only within the metroplex, but as well as distant customers in Texas, and across the USA and Canada. We take pride in delivering high quality parts at competitive prices. No Job is too little or too big for us! Our 12,000 square ft. CNC Machine Shop features an arsenal of precision equipment to tackle the high volume milling and turning demands of today's market. At Advance Machine & Tool you get your parts on time and you get them right. We stand behind our work to make sure our customers are satisfied! Combine our years of CNC Machining expertice with state of the art equipment and cutting edge software and the result is Advance Machine & Tool, a finely tuned manufacturing shop. Check out our Equipment section for a list of equipment. We cut all materials like aluminum and plastics and more difficult to machine materials like Stainless Steel, Copper and Pre Hard Alloy with extreme precision using CAD/CAM software as well as the newest CNC machine industry tools and equipment. We also do Prototypes, Long & Short production runs. Our state of the art inspection guaranties your parts meet your exacting tolerances. Precision Milling or turning on CNC machine is what we do best. Check out our Parts Section to see some pictures of the work we do at Advance Machine & Tool. This will give you and idea of the quality and precision you can expect from Advance Machine & Tool.